These routes usually require a high clearance vehicle: a truck or SUV, 4x4 is not necessary. Backcountry detailed maps are strongly advised. 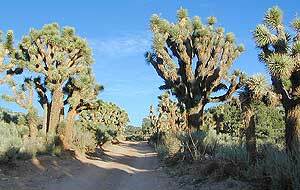 Odd looking joshua trees can be found in numerous spots across California's Mojave Desert. They are not specific only to Joshua Tree National Park. From Los Angeles, take Hwy.2 East, follow 210 jct to Angeles Crest Hwy.2. Up the mountain, left at N-3/Angeles Forest Hwy., pass Monte Cristo campground. Look for wide intersection with dirt road crossing. Left on Mt. Gleason Rd. (one lane paved) Forest Service Rd.# . 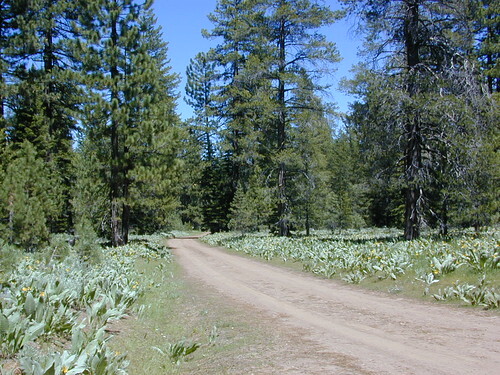 Take the left fork toward Messenger Flats campground (dirt road). 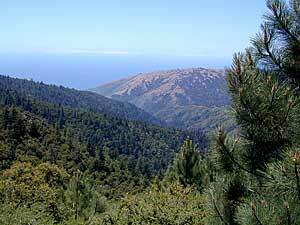 This high elevation area causes the vegation change from yuccas & manzanita to cedar & jeffery pines. Take the right fork toward Messanger, great little camping spot, continue on to Forest Service Rd.#4N33 & turn right into Moody Canyon. Follow the road to the bottom of the mountain. Hwy.14 is located down in the main valley. 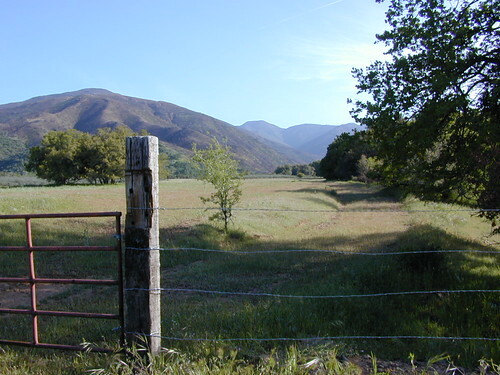 Contact Ranger District: Tujunga to make sure all roads are passable & no gates are locked. From Los Angeles, take Hwy.2 East, follow 210 jct to Angeles Crest Hwy.2. Up the mountain, left at N-3/Angeles Forest Hwy., pass Monte Cristo campground. Look for wide intersection with dirt road crossing. Right on Mt. Gleason Rd. (dirt road) Forest Service Rd.# . Stop at Mt. Pacifico campground on left & check out some great view over the Antelope Valley desert. Continue on main road & at intersection, make a right toward Horse Flats & Bandido camps, where Angeles Crest Hwy.2 can be accessed. Go right & head back down mountain or turn left & head over to Wrightwood, taking I-15 home. Contact Ranger District: Arroyo Seco to make sure all roads are passable & no gates are locked. Not for the faint at heart! High clearance vehicle & real nerves is a must for this one. From Los Angeles, take I-10 East to 15 North, exit Hwy.138 & left on Hwy.2 to Wrightwood. Upon return trip, go the back way through the neighborhood & Continue down through the Lone Pine Canyon. Right before Clyde Ranch on right side, turn right on Forest Service Rd.# 3N31 (dirt & rocky road) & head up hill over first ridge. 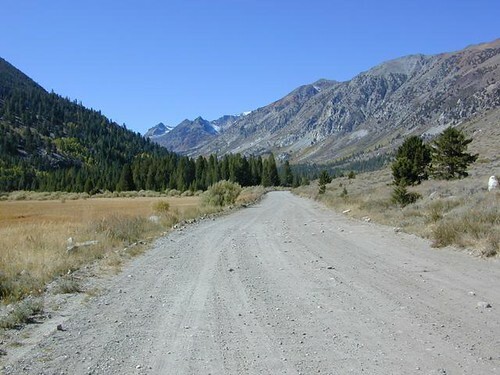 For a real rocky bumpy experience, drop down on right Forest Service Rd.#3N33 & decend into the Lytle Creek area. A river crossing or two may be at hand depending on the season. This is an extremely deep remote canyon with tons of hazards to be cautious of. Rock slides are common, so be aware. Large old pines trees are lining the river along with a ton of jagged, sharp rocks. Explore this very secluded area carefully. A few primitive camp spots are dotted throughout the area. The bottom entrance located to the left, Stockton Flat Rd./ Forest Service Rd.#3N06, may be still closed . In June 1997 - Signs reads "road closed 5 miles ahead". If so, head back up Forest Service Rd.#3N33 & turn right back on to Forest Service Rd.# 3N31 which is a ridge road, with nice views. Turn left on Forest Service Rd.#3N29 (very narrow) headed downhill towards Sharpless Ranch & Lone Pine Canyon Rd. At the bottom, turn right & head back over to I-15. Contact Angeles Ranger District: Mount Baldy to make sure all roads are passable & no gates are locked. Take 5N, 14NE, pass town of Mojave & approx.20 mi. Turn right on Redrock Randsburg Rd., veer left at Y to visit Garlock Ghostown or right at Y & continue up over the hills to the old rustic mining town of Randburg. Great spot to stop & look & take it all in. The real saloon may be open, (mid-days) if you are lucky. The joint is usually open daily. A small lodge, but food or no gasoline available in this town. Cafe or restaurant? Nada! Both bars have very limited hours on weekend & even less on weekdays. Tons of dirt roads to explore, but be careful of open mine shafts & private property signs. If you've got the time, head out toward Trona Hwy. & visit the Trona Pennicles. A lunar looking landscape area that is well worth exploring. The town of Trona has a gas station. Continue on into Panamint Valley area & visit Balarat Ghost town on the right side. If you are headed to Death Valley National Park, you may want to venture through the Wild Rose. Veer right at Y intersection. This area has tigt canyons & cool rock formations. Left on Emigrant Canyon - WildRose Rd. dropping down to Stovepipe Wells Ranch. Take 5N, 99N to Bakerfield & exit Hwy.178 headed towards Lake Isabella. Follow it up mountain & exit Hwy.155 to Wolford Heights & quaint river town of Kernville. Left at stop sign SM99 & head up the Kern River 30 mi. to Johnsondale (R Ranch), veer left at big curve, stay on SM-50 & within 5 mi., Turn left on Forest Service Rd.#23S16 to Thompson Camp Springs. Very popular area with beautiful primitive creekside camping in this area. Turn left on Sugarloaf Rd. Forest Service Rd. #23S16 (paved). This 18 mi. long ridge road runs through some beautiful Southern Sierra secluded forest. Great views overlooking the Kern River Valley. Pass Speas Camp. [Side trip option is over to Baker Point: Left on Forest Service Rd.#23S02 up to point & back track on #23S80 which leads back to #23S16] At Portuguese Pass, turn left on Forest Service Rd.#24S15, then left on #25S16 down to small community of Alta Sierra. At intersection Hwy.155: turn left back down to Lake Isabella or turn right & go down to the San Joaquin Valley. Contact Sequoia Ranger District: Greenhorn To make sure all roads are passable & no gates are locked. Take 5N, 14NE, pass town of Mojave & continue on to US Hwy.395 for a few miles. Turn left on Nine Mile Canyon Rd. - Co.Rd. #J41 & climb mountain, passing Joshua trees & Pinyon pines. This area maybe has one small lodge & restaurant. Plenty of horses up here too. Kennedy Meadows has a large campground. Take Forest Service Rd.#22S05, Just past Troy Meadows at intersection, turn right on to #21S03. There are tons dirt roads that lead to nice primitive camping areas. It is a big equestrian / horse area also.This road ventually dead ends into Trout Wilderness backpacking parking area. Continue back on Forest Service Rd.#22S05 / Sherman Pass Rd. which leads to Kern River Valley. [The mileage is approx. 60 mi. from Hwy. 395 to Kern River] Turn left on SM99 & head to Kernville & Lake Isabella. Contact Sequoia Ranger District: Cannell Mdws To make sure all roads are passable & no gates are locked. From Julian on Hwy.78, go east down Banning grade. When you get to the high desert, take a right on S2 - Great Overland Stage Route of 1849. Aprox. 5 mi. after Anza Borrego State Park sign, look for small dirt road on left. Turn left into Little Blair Valley. At crossroads veer right up over small pass & continue down into valley. Good primitive camping & wildflowers in this area. At T intersection, turn left for the Pictographs hiking trail or right into Blair Valley. Anza Borrego State Park is now charging for day use of this area $5. Collection boxes are set up at both entrances. Continue staright on back to paved road S2. Turn left & head southeast to Bow Willow Campground. Across from campground, on left side is a dirt road - these leads over to Carrizo Stage Station Site. Backtrack a bit & turn left @ first road, Canyon sin Nombre, continue back towards highway S2. Follow it until you hit I-8 & head west to San Diego. 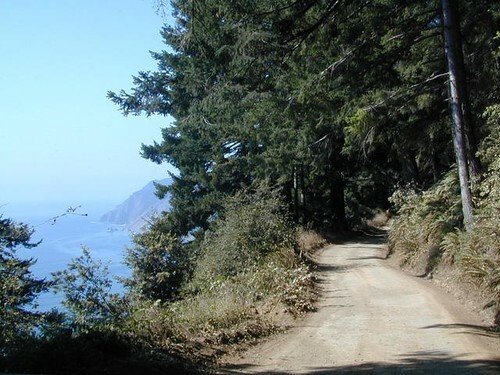 Take the back way into the Big Sur Coast, see some wooded canyons & above average views of the Pacific Ocean. Take 101N, pass San Luis Obispo & Paso Robles. Exit G18 & go left on Jolon Rd. Take left onto Mission Rd. & visit the old Mission San Antonio de Padua. Backtrack a mile & head west on Nacimiento-Fergusson Rd. Two very nice campgrounds are in this canyon along the Nacimiento River - Ponderosa & Nacimiento. 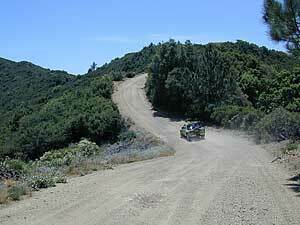 Right past camp Nacimiento Ranger Station, you will see a dirt road crossing. Take a left on to Coast Ridge Trail, Forest Service Rd.#20S05 & continue 5 mi. to right turn up hill #22S04 & onto Prewitt ridge area. Spectacular Views! Primitive campspots are dirt road dead ends with small clearings. Continue back on main road along ridge. Plaskett Ridge Rd.#23S02 (signage is wrong) is closed, but you can find access to the coast by continuing on the more primitive South Coast Ridge Rd. #20S05 towards Lion Camp. Drive approx.6-8 mi. & turn right #23S01 down Willow Creek area. This road will hit Coast Hwy.1 & you can take your pick to head north to Big Sur or South to Hearst Castle. Contact Los Padres Ranger District: Kings to make sure all roads are passable & no gates are locked.